Room additions are a great solution for providing additional living space to your home, if your family is growing, or is expecting to grow. Room addition costs are also comparatively low compared to selling your existing home and moving to a new and larger home. Room additions, versus buying existing larger homes, also offer the opportunity to be creative and to customize future living space. For example, you can elect to add a family room addition or bedroom, bump out your kitchen, or even build a garage addition with overhead living space. With room additions, you can aesthetically determine where the room addition ties into the existing home and select all of the exterior and interior finished materials. Room additions are not unlike building an entirely new home, particularly if the room addition includes a kitchen and/or bathroom. Most, if not all, of the standard trades that are required in building a new home are also necessary for building a room addition. Thus you will need to generate a set of buildable room addition plans, pull building permits, and hire either a general contractor or subcontractors for every specific phase of the project. It is also important to note that a room addition project can be disruptive to the occupants of the home. With a little upfront planning this disruption can be somewhat mitigated but do not expect a hassle free effort when undertaking the building of a room addition. It is a big home construction project. All of these items will dictate where you can locate your room addition, and will be evaluated by the building inspector when you go to pull a permit for your room addition. If you see potential issues with the property plot plan and your room addition concept, and are unsure how to proceed, visit your local building inspector or zoning board. They can help answer any questions you may have as well as provide some useful tips and ideas. 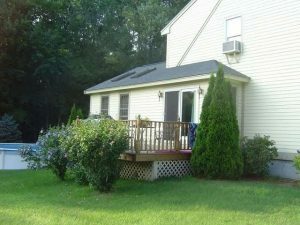 After studying the plot plan walk around your home and take a close look at roof lines, and existing doors and windows. Pay particular close attention to the side, or sides of the home where you want to add a room addition. You may also want to take a few pictures of this area to help you during the sketching and planning stages of your room addition project. Unless you are planning to pay cash for your room addition, then you will need to seek a bank loan. It is important to find out in advance of breaking ground what your budget is for your room addition. Your budget will help determine the size of your room addition and the types of building materials you will use. In addition, it may help you decide on how much sweat equity you will personally put into the project. When planning a room addition it is always important to understand its return on investment potential. Consequently it is wise to understand how building a room addition will impact the value of your home. The room addition type and size can be a major factor in setting the future value of your enlarged home, and bigger is not always better. Talk with a local real estate agent about your room addition ideas and plans to see if they are in line with market trends for your neighborhood. When developing your room addition plans, sketch out the dimensions of the room addition and how it will tie into your existing home. Also include a separate list of materials to be used in the construction. For obtaining a building permit your drawings should show cross-sectional views of the room addition so that the building inspector can understand what material will be used and how they will be tied together. The cross-sectional views should include from the concrete footing pads all the way to the roof. One of the most difficult aspects of developing a set of room addition plans is tying the room addition into the existing home in an aesthetically attractive way. It is also aesthetically important to develop a room addition design that does not swamp the existing home. With room addition plans in hand you can then begin the process of finding a general contractor and/or subcontractors. Selecting the right room addition contractor(s) is one of the most important decisions you need to make. It is very important to find the right one(s) to ensure your room addition is built correctly and to your timeline and budget. Contact neighbors and friends, check on line, and look in the phone book for potential contractors. National home addition and home building contractor referral companies are another alternative. These companies have large national databases of pre-screened and qualified contractors. There is no cost to the homeowner for working with these contractor referral companies. You simply fill out a free online form for your specific room addition needs and they will forward your information on to 3 or 4 local contractors in your area. The contractors will then get in touch with you to set up a meeting and to review your room addition plans. When obtaining room addition contractor quotes it is important to make sure that they provide you with a complete room addition cost breakdown list of every phase of the project. The more detail in the room addition cost breakdown list, or bid sheet, the more likely of an accurate room addition cost proposal. 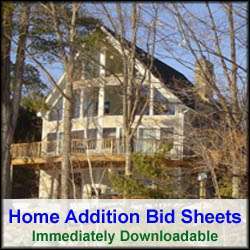 To help in obtaining accurate and consistent room addition contractor quotes, see my Room Addition Bid Sheet. The Room Addition Bid Sheet provides a request for quote section that you can provide to prospective building contractors. It also includes a comprehensive room addition cost breakdown table, in Microsoft Excel format, that allows the contractor to include his projected room addition costs for every phase of the project. When interviewing potential room addition contractors make sure you check their references. Usually a good litmus test for evaluating a home addition building contractor is to see how long the reference list is. The longer the reference list the room addition contractor provides to you, the higher the likelihood that he has a solid reputation. A long reference list also helps to get a feel for how long he has been in business and his level of pride in his work. Regardless of the length of the reference list, it is still important to contact at least 3 or 4 of the references. Contact a couple of more recent projects completed by the contractor and a couple 2-5 years out in the past. This way you can see how he has been trending with his work, as well as to see how the quality of his work has been holding out. Finally, it is also important to note that room addition construction costs are typically higher than building a new home. The reason for this is that room additions require additional effort to tie them into the home properly. In addition, a new home construction project offers economies of scale. With room additions, you may be adding only a few hundred square feet of area, whereas with a new home construction project you may be building 2,000 to 4,000 square feet of living area. So by planning properly, talking with town and real estate professionals, and hiring an excellent building contractor you can increase the likelihood of a successful room addition building project. And by requesting potential contractors to use and provide you with a thorough room addition cost breakdown bid sheet your room addition will likely meet both your schedule and cost requirements as well. Good luck with your room addition project!